Growing up in America has definitely given me a unique view of world history. A unique and biased view, many could argue. Yes, my world history classes covered the ancient Egyptians and the empires of ancient Greece and Rome. We learned about the French Revolution and British colonization. And yes, we even brushed upon both World Wars. But I didn't really have a sense of how much got left out until my first summer trip to Europe. I was signed up for a 9-day Busabout tour from Istanbul to Split with a bus full of mostly Australians. Our first stop after Istanbul was Gallipoli — a place I had heard about before, but honestly knew very little about. I just knew it was akin to a pilgrimage site for Aussies and Kiwis, but I was fuzzy on the reason why. Well, as it turns out, Gallipoli — a peninsula in eastern Turkey in between the Dardanelles and the Aegean Sea — was the site of one of the bloodiest, most ridiculous battles of World War I. And I'd never even heard so much as a whisper about it in any history class. This actually kind of pissed me off. I mean, I realize that distilling thousands of years of history down into a semester- or year-long course is tough. But I would have hoped that a battle with roughly half a million casualties would have at least merited a mention in my history book. The Battle of Gallipoli, which took place from April 25, 1915 to January 9, 1916, was important to history in more ways than one. First of all, it was seen as a major defeat to the Allies (who were trying to secure a sea route to Russia), and a defining moment for the Turks. It would be the spark to light the fire for Turkish independence years later lead by Mustafa Kemal Atatürk, one of the commanders at Gallipoli. And for the the Australian and New Zealand Army Corps (ANZAC), the battle would mark a turning point in establishing each country's national identity. That's kind of a big deal. But it took a visit to Gallipoli for me to learn any of it. I've done some research into dark tourism before (tourism to sites associated with death and/or suffering), and have found that motivations ARE often tied to a person's nationality and personal history. Americans, for example, are much more likely to want to visit places like Pearl Harbor and Ground Zero for emotional reasons than, say, people from China. For a Chinese person, Pearl Harbor is just another attraction in Hawaii, and Ground Zero is a cool place to get a photo taken. For Americans, though, these places are almost sacred; these are places where OUR history has played out and been memorialized. I knew, then, that visiting Gallipoli as an American would be different. I have no ties to the Aussies, Kiwis, Brits, or Turks who lost their lives on these far-off shores. But I was still interested to learn more about it. Our visit took place on a hot and sticky day (a running theme for me this summer), with the sun blazing overhead and barely any breeze coming in off the Aegean. It was as if the weather was actually trying its best to make Gallipoli feel heavy and oppressive. We had a local guide for the afternoon, who rode around on our bus with us for about 4 hours, taking us to every spot integral to the Battle of Gallipoli. We began at Breaker's Beach, which was originally supposed to be the main landing point for the Allied forces — comprising British, French, Australian, and New Zealand troops — on the peninsula. However, for some unknown reason (bad intelligence? poor tactics? misjudging the tides? ), the Allies landed a couple of kilometers north of the target beach, on a beach that was much more difficult to take. This would be the first in a series of stupid mistakes that would allow this battle to drag on for months. As we stood in small patches of shade listening to our guide detail the botched attacks, stalemates, and dismal conditions that characterized the Gallipoli campaign, I could feel that uneasy feeling in my stomach growing — that feeling that often accompanies things that appall me. It never ceases to amaze me how terrible war can be. We next made our way up to a larger beach that was eventually used as an Allied camp, and walked along the coast to ANZAC Cove — the spot where the Australian and New Zealand forces first landed and succeeded in gaining some ground on the Turks, if only briefly. As I dipped my toes into the turquoise Aegean, I was acutely aware of how many young men (and they WERE young — only about 18 on average) lost their lives in these waters; on this sand. This, more than anything, nearly brought me to tears. It tied in with what our guide told us about the young men from opposing sides befriending each other in between skirmishes — the Brits, Aussies and Turks would all play football together; trade cigarettes; share laughs. And then, when their commanders told them to, they would pick up their guns and — I don't know how — kill each other. After sobering ANZAC Cove, we headed up to Lone Pine Cemetery, the site of a major battle between the Australian and Turkish forces in August 1915. For 5 days, the opposing sides fought for control of roughly 150 meters of land atop a hill. The battle was part of a larger Allied offensive to gain high ground from the Turks, but the Battle of Lone Pine was the only one that was really successful — the Australians eventually gained the upper hand. But the battle was not without casualties. Roughly 11,000 men died here. 11,000 men. In 5 days. In a space not much longer than a football field. Mind-boggling. Today, Lone Pine serves as an Australian/New Zealand memorial at Gallipoli. From Lone Pine, we next went to the Turkish 57th Infantry Regiment Memorial. History is written by the victors, they say, but even though the Turks won at Gallipoli, I can guarantee that most Westerners don't learn much about Turkey's losses in this campaign. Here at this memorial, though, we did. While sipping on cool lemonade, we listened as our guide told us about the 57th Infantry Regiment — one of the regiments that Atatürk commanded. Atatürk is famously quoted as having told this regiment: “I am not ordering you to attack. I am ordering you to die.” And die they did. Every single one of them was either killed or wounded. Today, as a sign of respect, there is no 57th Regiment in the Turkish army. Our last stop of the day was at Chunuk Bair, site of another main battle of the August Offensive of 1915. Here, New Zealand infantry attempted to take the hill from the Turks on August 8. Nearly every one of them died. Their bravery is remembered with a memorial — right next to a statue of Atatürk. There are so many more stories associated with Gallipoli that I could tell you. The one about a pocket watch saving Atatürk's life in battle. Ones about the horrible trench conditions that claimed many lives on both sides. Yes, it may be true that these are not MY stories. But they are still stories that deserve to be told. When we left the Gallipoli Peninsula, a few of the Australians in my group asked me what I had thought of it. “Was it really boring for you?” they wanted to know. No, I told them. No. Visiting Gallipoli wasn't boring for me. It was a part of history that I ashamedly had known nothing about, and now could appreciate for what it was — a heartbreaking tale of war and loss. A tale I'm glad I heard, because it helped remind me — as all “dark” places like this tend to do — how precious life is, and how lucky I am to still be living mine. Have you ever visited Gallipoli? If not, would you want to? *Note: I visited Gallipoli as part of a discounted 9-day Classic Balkan Trek with Busabout. But all opinions, as always, are my own. Great post, Akatuki. I’ve heard of Gallipoli but as you said, as an American had only a fuzzy idea of what it was all about; so thanks for explaining it clearly. It’s so hard to imagine that many young men dying in such a small space of place and time, or soldiers being friends one minute and enemies the next. Thanks, Edna. It’s a place I’m glad I visited, but it’s certainly not a “happy” one, despite how beautiful it is. It was great to learn more about it, though. Well hopefully I helped explain it a bit better for you! I’m definitely glad we had a local guide, because it really helped me understand it better. Glad to have sparked your interest, Caroline! There’s apparently a movie with Mel Gibson in it about the battle that was made in Australia a few decades ago – maybe you should check it out! As an Australian, this is something high on my list to do. My Great Grandfather actually fought in Gallipoli and then later died in France in WWI. So it’s certainly very important to me. It’s funny how different countries have to miss out on certain historical events in their education. I don’t remember learning much about American history when I was at school, so I guess it works both ways. It definitely does work both ways, Dean. I hope you make it to Gallipoli one day! I have to admit that I have never heard of Gallipoli even though I am European and we do cover the world wars quite detailed in school. 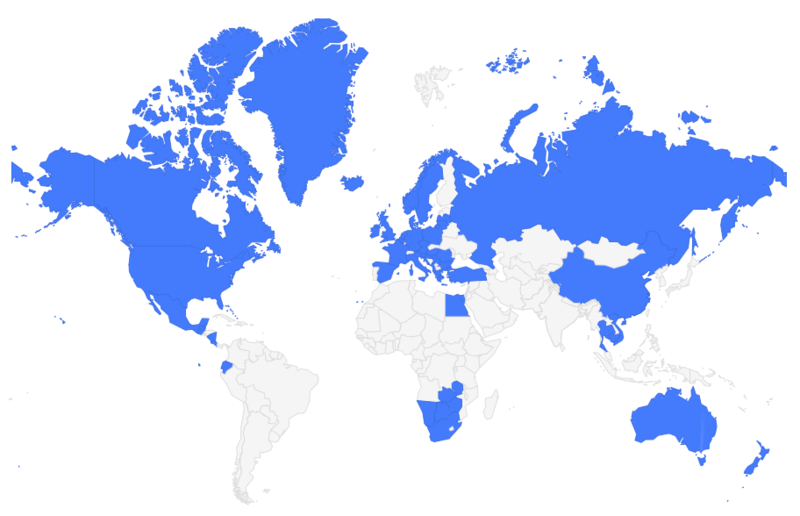 I am always surprised when I found out how little we learn about other countries’ history at school – for example, we barely learn anything about the Vietnam War or any other wars in Asia… or Australia! Yeah, it’s kind of depressing to realize how much gets left out, isn’t it? Hopefully you know a little more about Gallipoli now though! It’s crazy to think that someplace so beautiful once held so much violence and death. Loved hearing your take on this. I majored in history in college (with a focus on European history no less) and don’t recall learning anything about Gallipoli. I remember hearing about the Mel Gibson movie and knew it was about a battle, but that’s it. Speaking of dark tourism, I’ll be visiting Germany in December (Munich) and would very much like to take in a tour of the Dachau concentration camp. I imagine it would evoke many of the same emotions your visit to Gallipoli did and, in so doing, make my trip that much more memorable. Perhaps all our trips should include at least one “serious” experience to help ground us and remind us to appreciate our lives. It’s so crazy how our knowledge and education is so shaped by where we live! And yes, I think it’s really important to visit these sorts of “dark” places every now and then, for the exact reason you mentioned – to help keep us grounded. Great post. As a Kiwi it was a big goal of mine to get to Gallipoli and I managed that back in May, spending a day touring the battlefields with a private guide. It is hard to stand there among the cemeteries, on the beaches and on the ridges and fathom the disastrous events and huge loss of life that took place. I had been toying with the idea of returning for the ANZAC Day centenary in 2015; having experienced the commemoration site with no other people around, it would be quite the contrast to share it with 10,000 others! I think being there for ANZAC Day would be an incredible experience! Wow, I hardly knew anything about Gallipoli either – really just from what I had seen from Aussie and Kiwi bloggers visiting there on ANZAC day this past year. This was a really interesting piece and sounds like a really neat tour. I read a little more about the battle and history there and it’s quite fascinating. Ataturk’s words about the dead there are very poignant. Thanks, Laura, I’m glad you liked the post! The history of the place really is fascinating, and I’m glad it was part of my tour. And yes, those words from Ataturk make me tear up a bit every time I read them. I would recommend that you listen to the song “And the band played Waltzing Matilda” by The Pogues. It goes with Gallipoli. I will definitely have to check it out. Thanks! I too am American and don’t remember ever hearing anything about this battle. This was really interesting, thank you for sharing! I’m happy to be able to educate some of my fellow Americans about Gallipoli! Same as you, I had never heard of this before I lived in New Zealand, where of course, every young person travels to when they go to the UK on their OE on ANZAC Day. I liked the question your tour mates asked of you, since you really didn’t have any connection to the place. Very interesting! I think it was good that I visited with a bunch of Aussies, though. Many of them had family connections to Gallipoli, so it was really interesting to see/hear that part, too. Made it even more real for me, I think. Wow, I never learned about this either. Unrelated, but I’ll also point out we spent mayyybe a week talking about the internment of Japanese Americans in my 6th grade history class. Never again did it come up. I feel like I never learned the real truth about our history. Sad that we have to travel to really learn it, and most Americans don’t even own a passport. Just another example of how travel is one of the best learning experiences a person can have. I don’t know if I’ll get the opportunity in my life to visit Gallipoli, but I appreciated getting to see it through your eyes. I’d heard about it just a little after living in New Zealand (and trying once, admittedly unsuccessfully, to watch the Mel Gibson movie), but I, too, am sad to say that I’m fairly ignorant about the battles. One of my first trips overseas included a visit to the D-Day beaches in Normandy, and I can still recall my feelings as a seventeen year old. I can imagine the emotions for Australians and New Zealanders who pay a visit to this part of Turkey. I even got emotional at Gallipoli. I can only imagine the intense emotions felt by people with stronger ties to the place. But, then again, I get emotional at most “dark” places like this. This was a really interesting read. Before today, I’d only heard of ANZAC because of the day in April when Aussies and Kiwis get very drunk! It’s good to understand some of the history behind the tradition! Heh. Yes, ANZAC Day is indeed about much more than getting drunk! I feel the same way. Growing up in history classes, the battle was never mentioned to me. I really only learned about the details of Gallipoli until another travel blogger wrote about his experience there as an Australian. It was interesting to see Gallipoli from American eyes with your account. I’ve only ever read about Gallipoli from an Australian or Kiwi perspective, too. Which is why I really wanted to write this post! At the end of the day, I’m really glad I had the opportunity to visit. 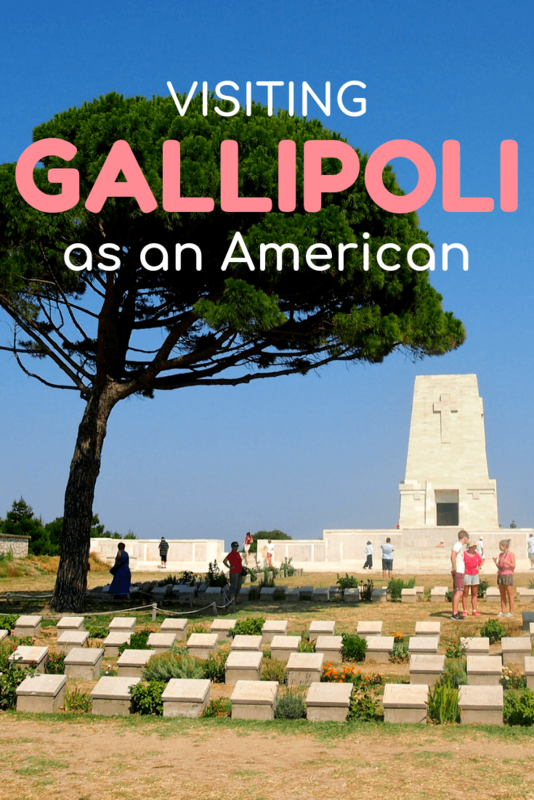 Terrific post especially since it was written by an American (I find tons of blog posts about Gallipoli but they’re usually written by Brits, Aussies or Kiwis). I’m in the minority here and always knew about Gallipoli (at least from high school onwards) but only because I’m an ubber history geek and am especially interested in WWI since it’s taught so little as you’ve said in American school curriculum. My great-grandfather fought in WWI (he was on the Western Front in France) and so I would love to visit all WWI battlefields, most especially Gallipoli. Your pictures were fantastic and your accompanying text most fitting. Thanks so much, Julie! That’s great that you’re a history buff and know a lot about Gallipoli (I’m sure you know more than I do!). Yeah.. I have an uncle who was vaporized by a German artillery shell in France somewhere and it made visiting graveyards a big deal for my dad. Not so much for me, as said uncle had died before I was born, but still. It was interesting to me years ago when a French friend observed that France “won” the 2nd world war. I was pissed and pointed out that my uncle had died liberating France after Germany had taken control. Different perspectives on history. The French don’t believe themselves to be anywhere near as lame as Canadians and Americans view them…..
One thing the student in me loves about travel is the ability to see and hear some of those different perspectives on history. SO much better than any classroom I’ve ever been in. I had a “reality” experience years ago in Germany. I was out bowling with my boss and his bowling club. Basically a night out drinking with bowling as a side activity. Anyway, an older gentleman came over to me and started talking. I was surprised how good his English was and remarked upon it. Turns out as a teenager he had been shipped to a POW camp in Saskatchewan. The women of the nearby town took one look at the prisoners and started a school. Taught them English as well as the other subjects teenagers need to know. It was a little weird talking to someone who’d been a POW in *my* country while I was visiting his. Thanks so much for featuring such a special place for Aussies and Kiwis. The reason we commemorate ANZAC Day (our War Memorial Day) on 25th April is because it was on that day in 1915 that the ANZAC troops landed on the beach. This same beach would later officially be called ANZAC Cove. There’s very few countries (like Turkey) that would bestow such an honour by naming a part of their country after an invading force. However, it says a huge amount for Turkey and those who lost their lives in that hideous battle. I’ve visited and it was an extraordinary experience – once that will stay will me for a lifetime. I agree that it says a lot about Turkey as a country! You might want to watch the 1992 NZ film “Chunuk Bair”, which was based on the play “Once on Chunuk Bair” by New Zealander Maurice Shadbolt. I found your website by chance when I was look something on the internet. And love your many travel acticles. First of all ; I want to say welcome to my beautiful country Turkey! As a Turk ; liked your article regarding to Turkey / Gelibolu (Gallipoli)… It is nice to heard that some Americans or another people from different countries are interesting our history. You’re always welcome! And , as our great leader Mustafa Kemal ATATURK’s said ; After having lost their lives on this land they have become our sons as well. Greetings from Turkey. I love history of all sorts – one of my favorite things about traveling is getting to learn more about the histories of other countries! It’s a great shame that all around the world, educational curriculums cover almost prehistoric dates up to 20th century and abruptly stop there. – Ancient greek states which was founded in current Turkish soil, Anatolia. – Early Turkish countries founded throughout time in Central Asia and the “. – Arabic countries after Islam. – A “kinda more detailed but not even close to full” summary of the Seljuk Empire. – The whole history of the Ottoman Empire. – Founding of the republic and the reforms after that. – Life of Mustafa Kemal Ataturk. That’s it. According to our curriculum, history “that is important” is between 1037 (Founding of the Seljuk Empire) and 1938 (Death of Atatürk). And only includes the Turkish. I don’t know what is being thought in Europe or USA, but I’m almost sure that the general idea is more or less the same. This unfortunately gives way to all kind of stereotypes, We think French are lame because we know almost nothing about Napoleon. Italians are bad at war? Then teach the people about the Roman Empire. Ottomans were very cruel Christian-haters? Teach about the fall of Constantinople. I believe this wide-spread education is the key to a global understanding of no matter which country, religion or ethnicity we belong to, we are basicly the same as a human being. I think you are absolutely right – this definitely isn’t confined to just one country; I think most educational systems take a “OUR history is the most important” approach. I DID learn a lot about ancient history in school (the Greeks, Romans, Egyptians, etc. ), but a lot of the more contemporary history was largely left out. Congratulations Akatuki on your great article about Gallipoli. On behalf of all Aussies & Kiwis your words and images would not go astray in the classrooms of our countries. Aww thanks so much for those kind words! This was a really interesting post Akatuki! It is always shocking when you learn about something that is so important in one region, but virtually untaught in others. I remember feeling similar when I first learned about the Khmer Rouge in university and couldn’t believe I’d never known anything about it before! Something else you may not know is the importance of Gallipoli to Canadians. While we fall under the category of “Brits” at this time, Newfoundlanders played a major role in Gallipoli. Just like someone recommended “Waltzing Matilda” earlier on, I’d recommend “Recruiting Sergeant” by Great Big Sea. Catchy song, but such a sad story. Yeah, we learned very little about the Khmer Rouge in school in the US (though perhaps it’s because we feel guilty for supporting it for a while?). Going to the Killing Fields in Cambodia (and the sites in Gallipoli) was a way better learning experience than anything I could have learned in a classroom, though. Travel really is the best education! My step daughter lives just south of Sydney and on a visit she gave me a book on Gallipoli. Amazing story. It is sad what we don’t learn about in history classes! I would love to go there someday. Great pics! I’m really glad I went and learned about it. Just more proof that travel can be such a great education! i love looking at people learning about other cultures. Im an Australian and it made me very happy to read through this as we learn about multiple times. when i first learnt about the ANZAC sacrifices from both wars i did and still feel very proud to be Australian.